With the ability to brew 10 cups of coffee in under 9 minutes to maximize flavor and aroma, The Capresso CM300 is a programmable 50 oz. coffee maker with a stainless steel thermal serving carafe. The Automatic Brewing function allows you to set a pre-programmed time, so your coffee is ready when you are. Removable water tank comes with a charcoal water filter that removes most water impurities, making coffee taste better. Push button swing out filter comes with removable GoldTone Filter or can accommodate paper filters. The Capresso CM300 offers a setting for brewing in smaller batches, programmable clock/timer, water level indicator and concealed cord storage. This Capresso thermal coffee maker is rated #1 on list of 10 Best Coffee Makers On The Market by Business Insider & FindTheBest. 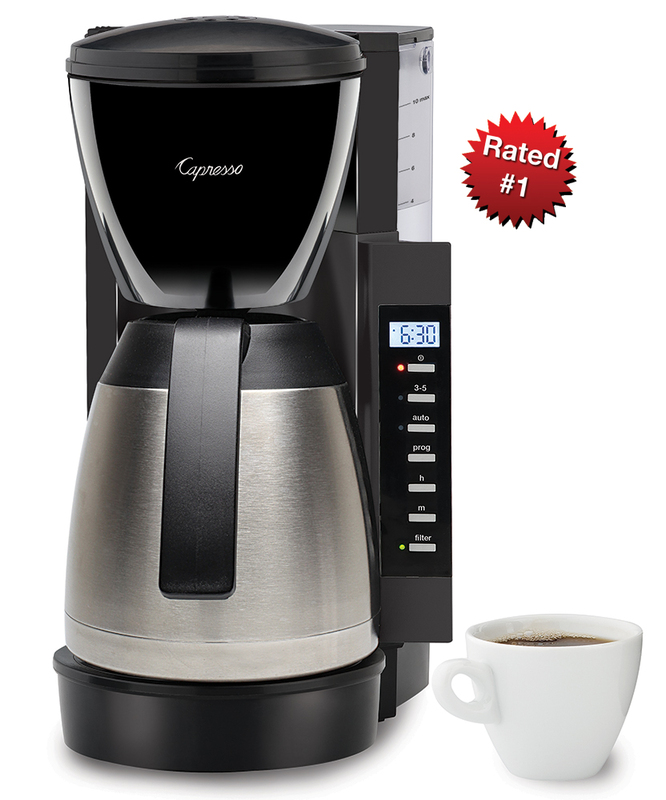 Brews 10 cups of coffee in under 9 minutes for maximum flavor and aroma. Drip stop allows you to pour coffee during the brewing cycle. This is the second Capresso I've owned. It makes wonderful coffee and I love not having a glass carafe to break. I looked around awhile and did comparisons. I wanted good tasting coffee and knew there was a better brewer and I found it! I love my coffee pot and how easy it is. Delicious and not acidic! It actually tastes as good as it smells! Love it! Really good customer service website and delivery. The Capresso coffee maker is wonderful. It has a small footprint, which works with most decor. It brews quickly and quietly. The water chamber comes with a carbon filter for a fresher tasting cup of coffee and we think it really makes a difference. Speaking of water chambers, our former machine always retained water, which was likely a breeding ground for bacteria. The Capresso is completely drained and dry after each brew. The carafe has a wide opening,which makes it easy to clean. The Capresso's lid has an 'open and closed' position, which allows the coffee to stay hotter longer. I could go on and on about this wonderful little machine. I'd say, this is the best coffee maker we've owned. Makes great coffee in less time than most coffee makers. Really like the stainless thermos. Much better than glass in our household. Q: I would like to return my coffee maker. I spoke to your customer service techs and followed their recommendations. My complaint was that the coffee was not hot. They suggested making a full pot. This worked but I did not need 10 cups. I would be throwing 4 cups away daily. Not an option. I filled the carafe with hot water prior to brewing. This helped on first cup but was still no where near hot and the second cup was barely warm. Thank you. I am very sorry about this purchase. I bought a $30.00 Bella coffee maker at Walmart and am quite pleased with it. A: We have had a couple of Capresso coffee makers in the past and don't feel this carafe is nearly as good so I agree about coffee temperature. One odd telltale characteristic is that after brewing the bottom is really hot as though there is a heat plate. We find it just okay but we make ten cups at a time and drink it within a short period of time. Overall the coffee maker is a step down in quality compared to their earlier products.